Samurai sword 7.5" overall 5" mirror polished blade dull edge blade 2.5" leather and real ray skin wrapped handle includes mini sword stand, scabbard includes certificate of authenticity. 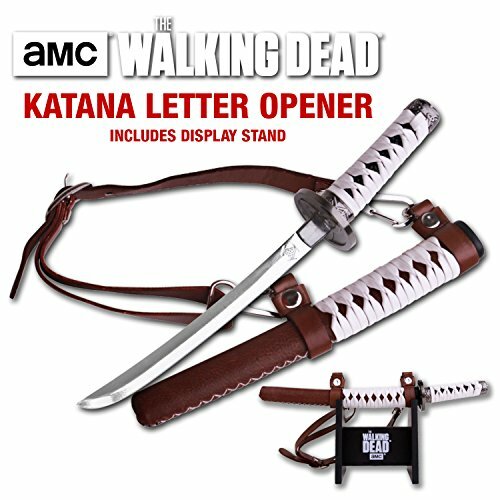 Open your mail as easily as a zombie's skull with this beautiful letter opener modeled after Michonne's sword on The Walking Dead. Sword measures 7.5 inches in overall length. 5" mirrored polished, dull edge blade. 2.5" leather and real ray skin wrapped handle. Includes mini sword stand, scabbard and Certificate of Authenticity. If you have any questions about this product by Walking Dead, contact us by completing and submitting the form below. If you are looking for a specif part number, please include it with your message.